Sphingomyelin Assay | Cell Biolabs, Inc. 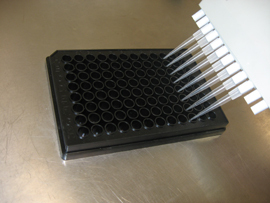 Cell Biolabs’ Sphingomyelin Assay Kit is a simple fluorometric assay that measures the amount of sphingomyelin present in plasma or serum, tissue homogenates, or cell suspensionsin a 96-well microtiter plate format. Each kit provides sufficient reagents to perform up to 96 assays, including blanks, sphingomyelin standards and unknown samples. Sample sphingomyelin concentrations are determined by comparison with a known sphingomyelin standard. Winkler, E.A. et al. (2014). Blood-spinal cord barrier disruption contributes to early motor-neuron degeneration in ALS-model mice. PNAS 111:E1035-E1042.